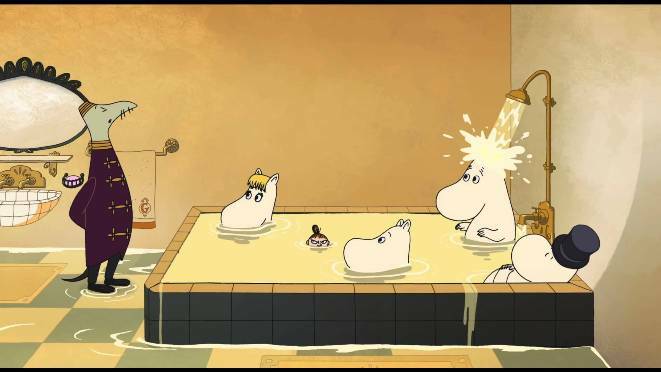 Plot: The slow ambling Moomins drift their way into an upper class lifestyle on this adventure and find themselves somewhat out of step. 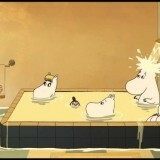 Finland’s squishy, lovable family of Hippopotamus are ever so enchanting on this sea voyage adventure. Driven by the lure of the high-life, Snorkmaiden (Stephanie Winiecki) convinces a besotted Moomin (Russell Tovey) and his clan to venture across the harsh waters to Riviera, a place crawling with celebrities, fancy parties and new love interests. Moomin struggles to hold onto the affection of Snorkmaiden finding himself very much out of his depth as he does all manner of things to win back her love, dueling included. Directors Xavier Picard and Hanna Hemilä do a great job of bringing the comic strip characters to life. There’s something for everyone in this film, with themes of jealousy and self-discovery made palatable for a younger audience in a way that doesn’t alienate or patronise the older crowd. With eccentric artists and peculiar pirates the film can run away with itself occasionally, however Picard and Hemilä always manage to steer things back on course delivering a subtly entertaining watch. Narratively speaking Pikku Myy (Ragni Grönblom) didn’t quite find her place in this movie but was certainly an enjoyable character to watch. A complimenting musical score and gorgeous visuals. Moomins on the Riviera shows that the stunning simplicity of 2D animation can still pack a punch in a world predominantly ruled by CGI and 3D. The adventure may not get your heart racing as with some of the animated flicks these days and is comparatively slower in pace but a worthwhile watch.